Yesterday I posted about taking some profit at near the highs and to expect some resistance near the 8400 value area. We have exerpienced some profit taking since last night and into this trade day. What has been nice to see is that the selling is not a broad market withdrawal into cash. It appears we have a rotation of capital into altcoins markets – which is exactly what we want to see. 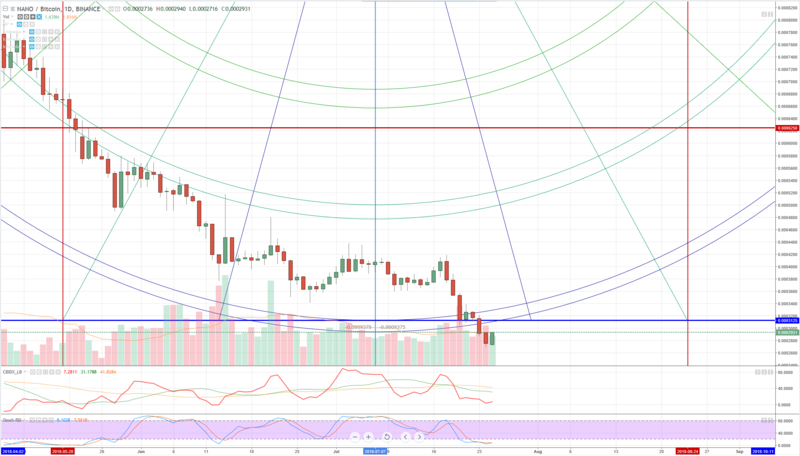 And some of those altcoins are considerably extended into their structural oversold conditions and are also lagging in performance against their peers in the altcoin market. Those have turned into great trade opportunities. One of the common things you’ll see on these charts is the extended oversold conditions on both the slow oscillator (Composite Index) and the fast oscillator (Stochastic RSI). The current chart structure of STEEMBTC is lagging when compared to it’s peers and it is also at /near an all time low. When we are seeing a cryptomarket adding market value, getting into these alt coins can be very profitable. Of all the charts and things I trade, the ugliest and most beatdown is the NANOBTC chart. I have no idea why it gets smacked around so much, but right now it looks like a primo time to buy. Why? It’s at an all-time low. Additionally, the current daily candlestick appears to be closing above the high of yesterday and it’s forming what appears to be a tweezer bottom formation. The oscillators are both oversold and sloping back up. The major harmonic level of 0.0003125 is right above and is the ultimate support level for this pair. 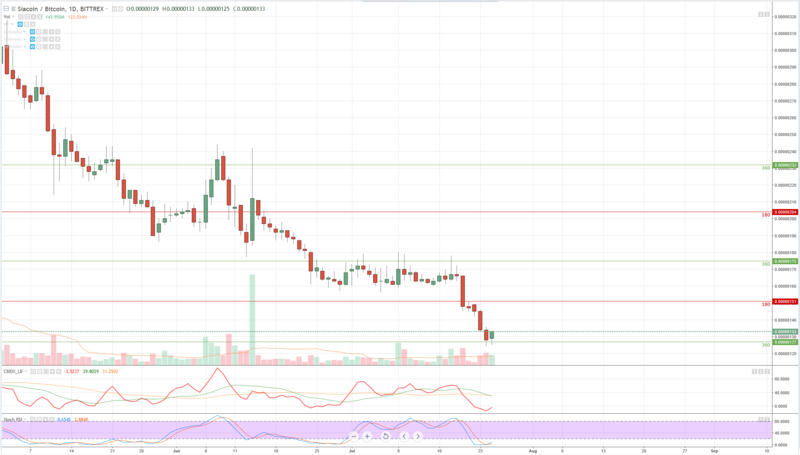 SCBTC (Siacoin) has the exact same pattern as the two coins above. Excellent and sufficient conditions have been formed to consider a long trade from this zone. Conservative traders may consider waiting for the close of the daily to trade above the prior candle high. 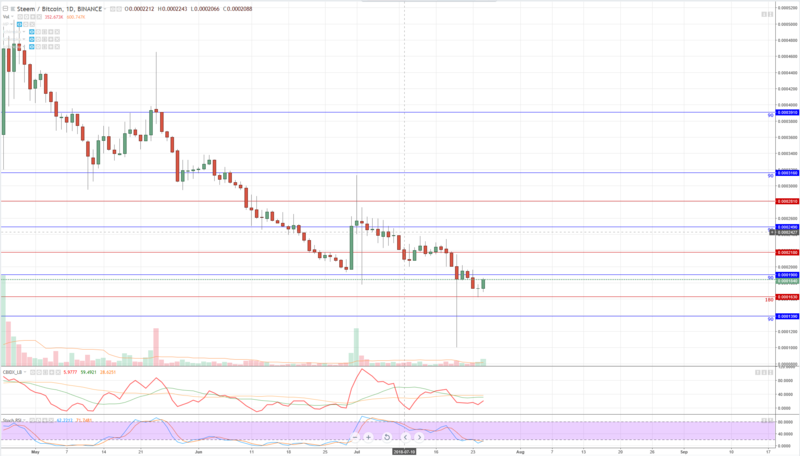 LSKBTC is another coin in this group showing a great long opportunity. One thing that really sticks out on this chart is the significant volume that has been traded on this coin compared to the week prior and the 20-day volume average. 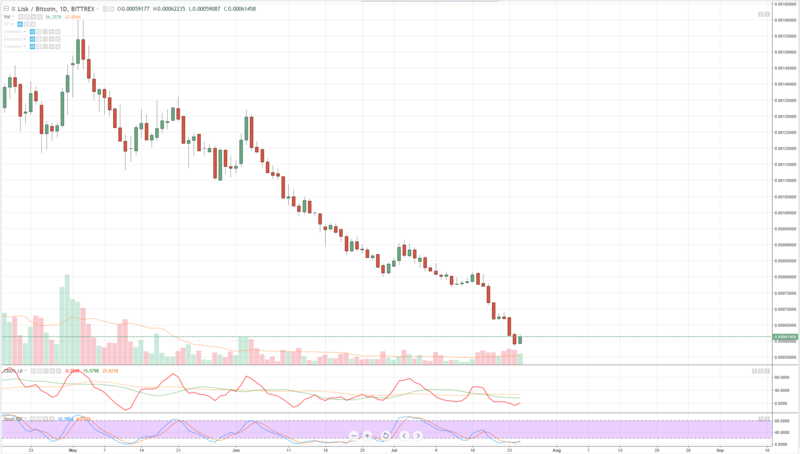 There has been some definite signs of accumulation with this particular coin. If we get an inside bar close with higher or equal volume, that will be a strong reversal signal for this coin.